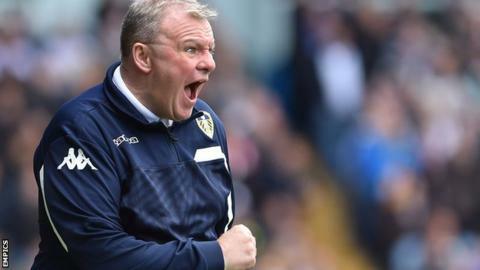 Leeds head coach Steve Evans says his future at Elland Road may be resolved before the club's final game of the season at Preston on 7 May. Speaking after Saturday's 2-1 loss to Charlton, Evans revealed he held talks with owner Massimo Cellino on Friday. The 53-year-old Scot, who took charge of the Championship club in October, said: "There were a lot of positive, constructive things said about myself. "I gave my views on what we need to win promotion next season and he gave his." The former Rotherham boss continued: "Time beat us on Friday but the decision on my future may come sooner than the Preston game. I think Mr Cellino is ready to make his decision. "I believe we need between four and six quality players. If that happens I will deliver the play-offs next season, given the opportunity, and I know the supporters deserve better players to represent them." Evans, who is the sixth full-time manager to work under Cellino since the Italian took ownership of Leeds in 2014, has won 14 of his 37 games in charge of the Whites. Saturday's defeat left Leeds 12th in the table, but a win at Deepdale will secure a top-half finish in the second tier for the first time since the 2010-11 season.